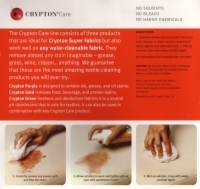 What makes the Upholstery Cleaning Kit different? 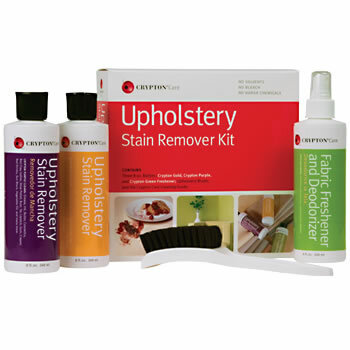 The Upholstery Cleaning Kit doesn't use harsh chemicals or solvents, yet can remove nearly any stain. What are the Upholstery Cleaning Kit's strong points? Purple and Gold cleaners remove stains, Green freshener kills microorganisms and removes odors, soft-bristle brush helps with tough stains. 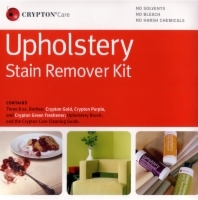 What else should I know about the Upholstery Cleaning Kit? The Upholstery Cleaning Kit is safe on all water-washable fabrics, but we always recommend testing before full use. Manufacturer quote: "the most amazing textile cleaning products you will ever try"